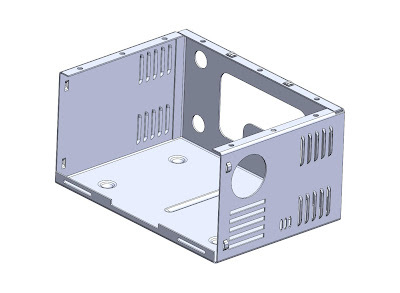 Unfolding sheet metal models with stamp features is handled in different ways by different modelers. Louver, dimple, bridge, lance and features that require forming are referred as stamp features in this context. For example, the model shown below contains few stamp features. FR unfold has two options for unfolding. (1) Unfold bend features : This option automatically recognizes all the bend features and unfolds only bends. All other features including stamp features remain as such as shown below. (2) Unfold with patch stamps : This option automatically recognizes bends and stamps. Unfolding is performed by unfolding bends and patching stamps as shown below.